first 4 days of the new salmon season. You are all invited to trawl the depths of classic spring fly water in the likes of some of the most famous pools in salmon fishing. Kilphedir, Salscraggie, lower Caen, upper Torrish and the Manse all await with the serious possibility of giving up a fresh chrome sided beauty and this year ( I’ll stick my neck out ) that chance is better than ever due to the unseasonably mild conditions of early January. 2006 saw our last balmy pre-season and we were rewarded with 6 super sea-liced springers, all in January, who is to say that this cannot happen again. I had my first January salmon that year and it’s a memorable feeling I can tell you! Jan 18th to be precise and it was only the 3rd fish off the river. It all kicks off again this week on Friday 11th. The Sutherland Schools pipe band get celebrations rolling around 9.30am, River Board manager Sir Michael Wigan will welcome and instruct all on the proceedings for the days ahead and this year Ronald Sutherland (yours truly) has been invited to launch the customary first cast of the season. Please register at the tackle shop for your free fishing where you will see the prize on offer for the lucky angler who lands the iconic first springer. The impressive Austrian Crystal Bridge Hotel trophy is up for grabs along with a bottle of fine Clynelish and a super selection of salmon flies. With favourable conditions forecast I will be fishing with the following trusty combo of Mackenzie DTX 15ft rod, Loop Evotec reel, Carron Jetstream twin line medium sink 10/11 65ft head, 8ft Maxima Chameleon 18 lbs leader attached to my favourite 1.5″ copper tube Willie Gunn Special. 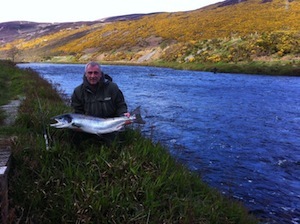 This is the ultimate spring set up in the Highlands and it has proven to catch so often. Don’t get too bogged down with a line density dilemma for early spring, aim your tactics at controlling a deep and slow moving fly and you will catch fish if they are there. I hope to see you on the banks of the Helmsdale sometime soon, it’s worth a trip!